Some days you can plan all you want but nothing goes to plan. Most days in the life of a stay at home mum are like this. Since baby number two has come along, all I seem to be doing is feeding him and trying to stop my toddler from poking his baby brothers eyes out. The struggle is real! Amidst all this craziness I find taking out even 15 minutes to cook gives me composure and peace. After all when you do what you love you are one step closer to nirvana! Today I was all set on making my husband his favourite chicken schnitzel with mash potatoes and roast vegetables. Only problem was I had none of the ingredients in the fridge. Talk about things not going to plan! While last minute food shopping was out of the question! Yes you do lose basic liberties like running out to the shops on a whim when you are a parent. My 15 minute window to put a meal on the table was rapidly closing too. 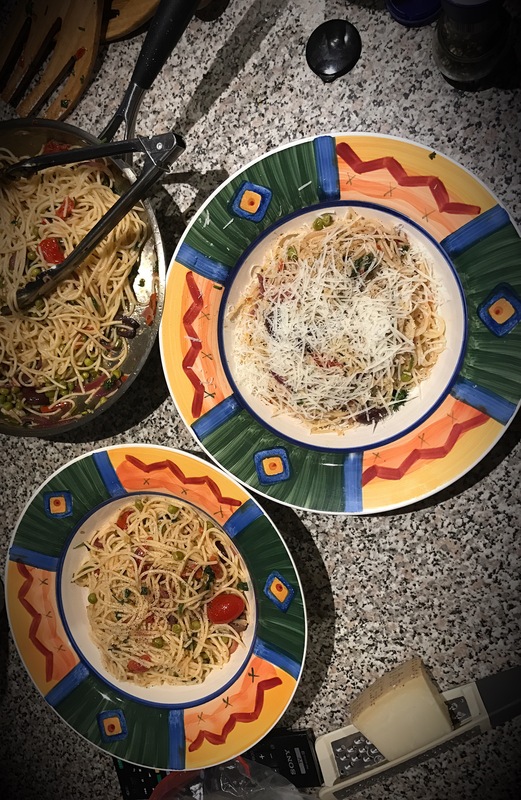 After ransacking the fridge and pantry, I managed to pull together – a pack of spaghetti, a punnet of grape tomatoes, handful of kalamata olives, capers, half a bunch of parsley and a bag of frozen peas. There was only one way this was going, we were heading to Italy (well metaphorically anyway) with a big bowl of pasta. In a heavy bottom sauce pan bring water to a boil. Cook the pasta as per packet instructions. 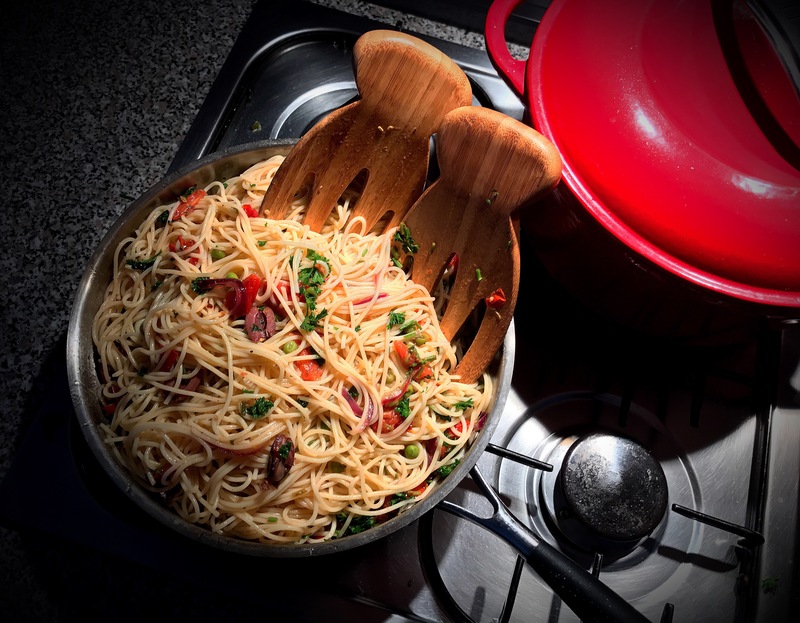 While the pasta is cooking, in another saucepan heat three tablespoons of EVOO. Add garlic, once aromatic add onions and cook until onions are lightly caramelised. Then add half of the chopped parsley, along with the olives and capers. Mix well. Cook on a low flame for four to five minutes. Now add peas and toss the mixture thoroughly. 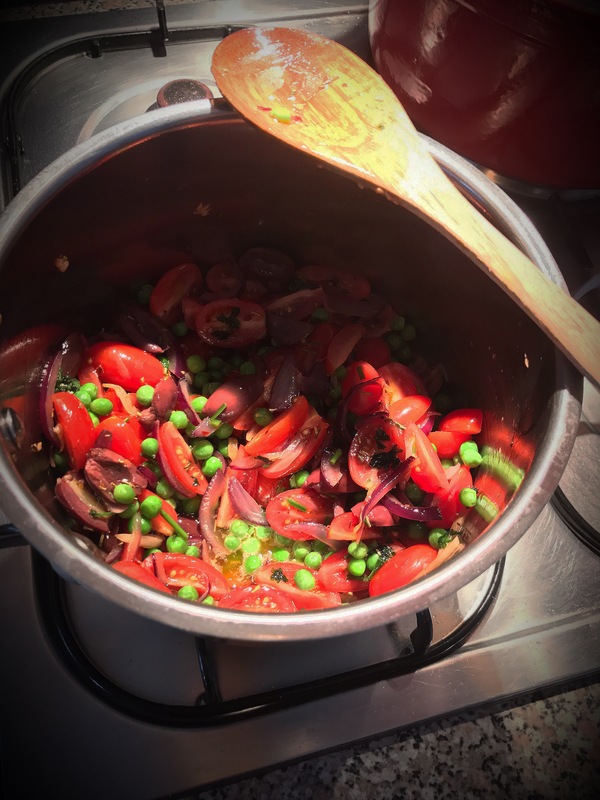 Once peas are slightly soft add the tomatoes, season with salt and cook on a high heat for two to three minutes. Finally add the pasta, followed by the rest of the parsley and EVOO. Toss through to make sure all the ingredients are evenly mixed. Your fridge clean out pasta is ready to serve. Garnish with cracked pepper and Parmesan. 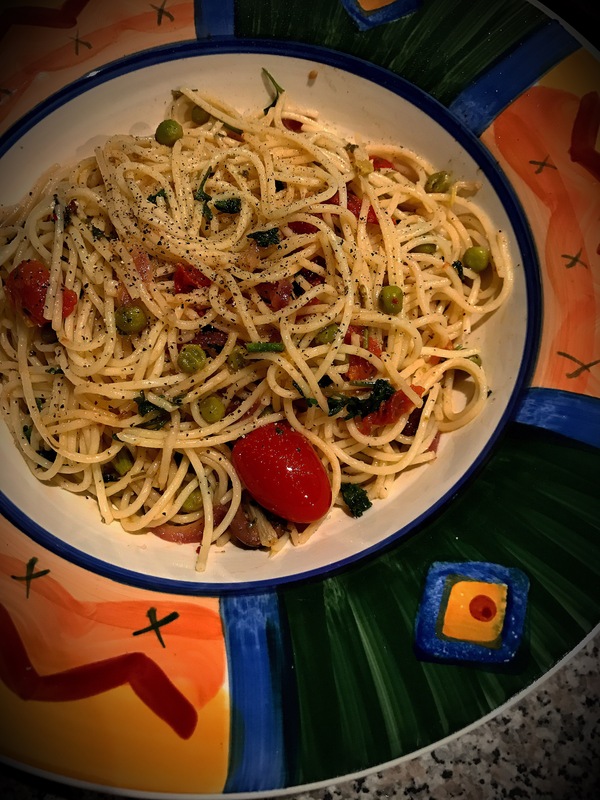 Hey Shakun, I read this recipe when I was feeding my 4 week old baby and thought why not try it – it looks quick and easy! And I had only those ingredients in the fridge! I know the struggle of being a new mum – can’t imagine having a toddler too and doing it all! Anyway, I made it and my husband couldn’t stop praising it! It smelled soooo good and tasted even better!!! I don’t know how you made up the recipe, but my husband said that I can make pasta better than him! Haha he being an Aussie and me an Indian, he was quite impressed! He said that he’s a lipsmackinglydelicious convert now! Please keep blogging new recipes and inspiring us to try new dishes. You’re doing a great job!